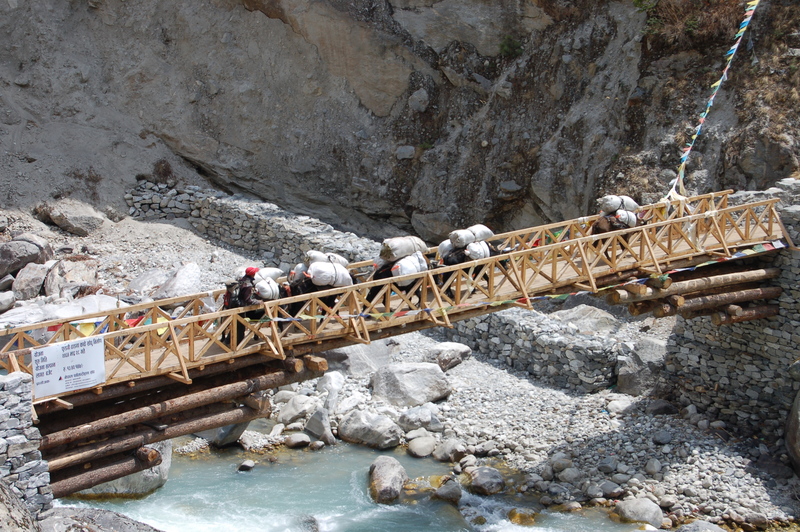 Traffic is picking up on the trail to Everest Base Camp, Nepal as more teams are flying into Lukla. The weather continues to be good. 4.30am start allowed us to reach the airport early in good weather. Kathmandu airport is undergoing maintenance disrupting early morning fixed wing flights so our plan was to take a helicopter to Lukla. With fewer people in the airport than usual, we cleared security, had tickets issued and bags weighed, along with us, in good time. Mort Rasmussen as he leaves Denmark. They said the rhododendrons and magnolia trees were in full bloom! Some Everest climbers actually fly wearing their 8,000-meter boots to save on the extra luggage expenses. I love this picture from Mort Rasmussen as he leaves Denmark. Yet another climber to watch is former US Marine Corps Sergeant Kirstie Ennis whose goal is to be the first woman with a leg amputated above the knee to summit Everest. They are now in Lukla about to start the trek to EBC. You can follow her on Twitter. Another motivating, and different wake-up call this morning from the Monastery. This is your fourth day on the trek and a rhythm is developing. You wake up, and immediately pull on your next warm layers. You slept in your base layers because it is only a few degrees warmer inside your room than outside. Even though you are going to the dining room, it is full-on coverage – hat, gloves, jacket, boots – the works. Also you know that the expectation is to get to the trail almost immediately after breakfast so just a quick trip back to the room to brush your teeth and grab your day pack and you are off. Today is a bit of a long day according to the itinerary. 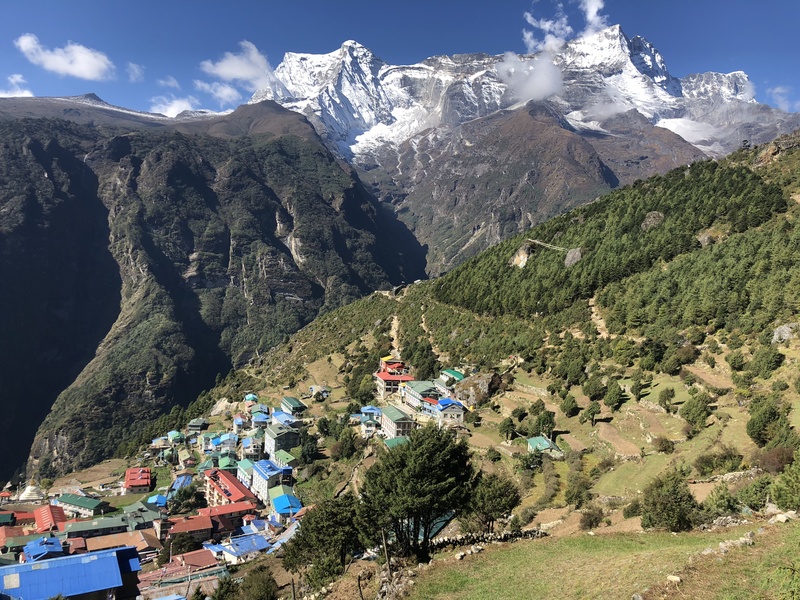 It calls for a walk from Namche at 3,440-meters/11,286-feet to Tengboche at 3,870-meters/12,664-feet, a gain of 430-meters/1,378-feet over a distance of 9 km/5.6 miles. But this is deceiving as there is a significant loss in elevation before you gain it all back, and then some. 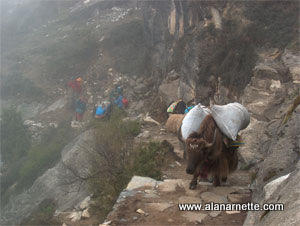 Nonetheless, you leave your teahouse in Namche and are on the dirt trail once again. It’s amazing how well-worn the trail is until you realize, this is their highway. All traffic in and out of Namche goes on this trial when going north; humans, beasts, everything. Since this is a National Park, there are no vehicles allowed so no scooters or AWD vehicles and even its rare to see a simple bicycle. 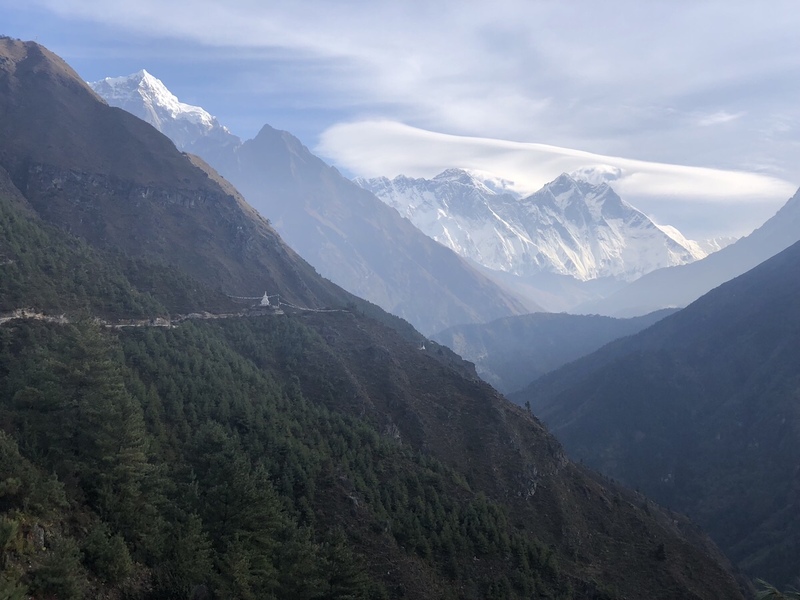 The trail flattens out after a short steep grade leaving Namche but the view, similar to yesterday from the Everest View Hotel, is simply stunning. Ama Dablam at 6,856-meters/22,494-feet dominates the view. When I first saw Ama Dablam in 1997, I said to one of the Sherpas, “That’s unclimbable, right?” He smiled and said “No.” Three years later I summited it myself on October 26, 2000, and for the first time began considering Everest. It’s considered one of the most beautiful mountains in the world along with Alpamayo in Peru, the Matterhorn in Switzerland, Fitz Roy in Patagonia and a few more. Today it is regularly climbed and in some ways is more crowded than Everest! The trail has a few ups and downs but steadily rises with a pleasant surprise at the top of each point. Everest always captures your eye. Even though it doesn’t dominate the view like Ama, you know what it represents. After a couple of hours and passing through a few small homes, or encampments where the owners have tables filled with jewelry and the like for sale, you enter the trees. And begin to go down, down, down. If you haven’t researched the trek fully this may be a surprise because you thought you had a day with a gain a few hundred meters or a bit over 1,300-feet. Ah, but this is where mountains play tricks on us. The trail becomes more narrow and the dirt looser. You are glad you have your trekking poles. Just as you think you have the swing of it, a yak train comes along – uphill – going faster than you are going downhill! Perspective, mountains encourage humility. After half an hour you reach the bottom this gully and most likely have lunch at a tiny lodge just before crossing a primitive bridge over the Dudh Koshi River at Phungi Tenga. You are now at 3,250-meters/10,662-feet. You dropped a bit but whatever the metric, it felt like more and you know you have to gain it all back before reaching Tengboche. It is in this moment, that you fully internalize that you are trekking in the Himalaya Mountain Range! I might add that there is an alternative way to Everest Base Camp by way of Goyko. I took this last autumn while climbing Island Peak and thought was a magnificent alternate to the traditional Khumbu trail I’m covering this year. For more details, please see my Island Peak posts. Crossing the bridge you pause to admire the sheer force of the rushing water. Being Spring, this is full glacial melt and the flow is impressive. You watch a leaf or a stick as its tossed around until you tempt yourself with a small case of vertigo. Back to reality, you finish crossing the bridge and look around. You are in a deep forest filled with silver fir, birch, rhododendron and juniper trees. The thickness of the forest is impressive. It’s easy to lose sight of a teammate not too far ahead or behind. But everyone stays to the dirt trail as it begins the journey every higher. Another “ah-ha” moment is when you realize the Namche Hill was nothing compared to this, and then you understand. The Himalayas and trek to Everest Base Camp or to the summit of Everest reveal itself in simple stages. Not too fast, not too harsh, but on an easy progression that pulls you deeper and deeper into the journey. The forest thins a bit as the trail hugs the ridges. At one point, water is running freely from a stream onto the hillside. A few Monks in their crimson robes are huddled around the pool. It’s unclear if they are gathering water, washing or just doing what Monks do – connecting with Mother Earth. But you take as a good sign that the Monastery must be close. Another trick. The trail gains more and more elevation and you begin to count each step. Today you brought two liters of water and are glad as when you break through the trees the sun is not shy about lighting the path, and warming the earth. And just when you think this might not end, a rock gate appears – seemly out of now where. A gateway to where? 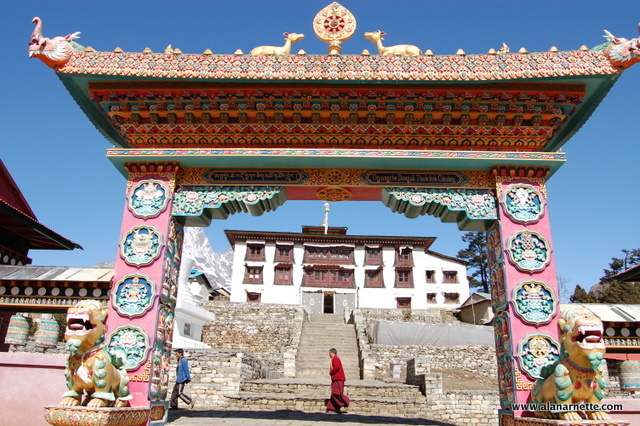 You walk through the wide arch and enter the grounds of the Tengboche Monastery. Directly ahead is a wide grassy field. A small group of yaks are grazing, gentle in their mass and with their steps. Their bells telling everyone around that this is their home and you are a visitor. To the left rises the Monastery. A simple but impressively colorful structure with stone steps leading up to the inner ground and more steps to the Monastery itself. You take a few more steps to see for yourself but are a bit surprised to see three elder Monks standing on a porch. They are quietly talking when all of a sudden one erupts into a deep, bellowing laugh that echos within the walls of the inner ground. The other Monks smile. And so do you. You are now at 3,867-meters/12,687-feet. This monastery was built in 1916 as a companion its mother monastery, the Rongbuk Monastery, in Tibet. It also serves as a gateway to Everest. In 1934, the Tengboche Monastery was destroyed by an earthquake and by fire in 1989. Both times it was rebuilt with the generosity of volunteers. Tomorrow, you might return for prayers as a guest inside the Monastery. The Monks are generous with their rituals and open to all who show interest, but no pictures are allowed during their prayers. But for now your guide sends you to the bakery at the of the grassy area for coffee and pastries. You don’t argue. Tonight will be spent a short walk downhill in another comfortable teahouse with a morning view, you simply cannot imagine. Thx Alan… I’ve really been enjoying these posts, having trekked to EBC in 97 also. I can barely remember lots of the days, and with no such thing as digital photogrpahy, or camera phones, my images are limited. One thing that stuck was that our first glimpses of Everest were from Kala Pattar, having trekked through mostly cloud and snow (higher up), with no signs of Everest at all… The way down was a different story!!! Hi Scott, Yes technology has really changed. I also remember back in ’97 of less crowds but great views. When I was there only six months ago for Island Peak, we went by way of Goyko and it felt like ’97 all over again.